STEVENS POINT, Wis. (June 26, 2017) -- The Stevens Point Area Convention and Visitors Bureau (SPACVB) announced today that they will host a Tourism Takeover on Wednesday, July 12, 2017 at Feltz Dairy Store from 5:00 p.m. to 8:00 p.m. The event encourages local residents to explore the tourism assets within Portage County, and to be a tourist in their own town. The third annual Tourism Takeover will be held at the Feltz Dairy Store, a new agritourism attraction in the Stevens Point Area. The event will offer free tours of the robotic milking facility at 5:00 p.m., 5:30 p.m., 6:00 p.m., 6:30 p.m., 7:00 p.m. and 7:30 p.m. There are 20 spots available on each tour and reservations can be made by calling 715-344-1293. Tours are reserved on a first come, first served basis. Attendees will also be able to receive a $4 off coupon redeemable for any item in Feltz Dairy Store, by taking a short survey. The survey is part of a research study being conducted by the SPACVB, as part of a year-long brand perception study which is supported by a Joint Effort Marketing (JEM) Grant through the Wisconsin Department of Tourism. Feltz Family Farm installed a high technology facility for automatic milking in the fall of 2016. Their cows are now able to choose when and how much they want to be milked. In 2017, the Feltz family opened their dairy store on June 5 which offers ice cream, dairy products, and local goods. 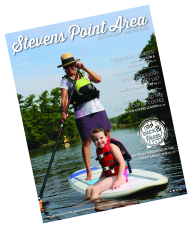 The Stevens Point Area Convention & Visitors Bureau is an economic and community development organization whose purpose is to expand Portage County’s economy by attracting conventions, sporting events and leisure tourists to Portage County. Millions of dollars from visitor spending and increased tax revenues are generated to increase commerce, sustain jobs, and to create a desirable destination. For more information on the Stevens Point area, visit StevensPointArea.com. You can also find the Stevens Point Area Convention & Visitors Bureau on Facebook (facebook.com/StevensPointArea), Twitter (twitter.com/StevensPtArea), YouTube (youtube.com/SPACVB), Instagram (instagram.com/stevenspointarea/), and Pinterest (pinterest.com/StevensPtArea).